Contrary to the classic Ray Henderson song, one often finds that the best things in life seldom come free. While this may be the case when it comes to your dental care, to quote another famous song; “Don’t worry, be happy!” as there are numerous payment methods available here at GPS Dental, that may make dental financing easier for you and keep you smiling! 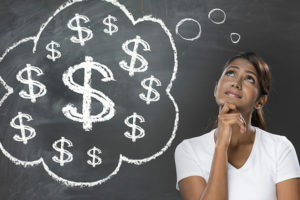 Dental Financing: Five great options! At GPS Dental, we have five payment options to choose from. Each of which can be implemented at your discretion upon receiving your treatment, and of course may vary depending on what has been agreed upon. Dental Insurance: One of the smartest and perhaps most obvious ways to help pay for your dental care is through your dental insurance provider. Many dental insurance plans can provide excellent coverage depending on the treatment you receive. However, it’s important to realize that the purpose of dental insurance is to assist you in covering some of, but not all of your treatment. Additionally, certain types of dental treatments may not be covered by your insurance at all. Therefore it is very important to understand the full extent of your insurance coverage, or to be able to provide your insurance plan information when you visit us. By providing us with your insurance plan information, we will be able to make sure you receive the benefits your plan provides, and advise you on what treatments may or may not be covered. Cash: While paying out of pocket is not always the most inexpensive solution, sometimes cold hard cash or even a personal check may be the simplest and most straightforward approach when paying for your dental care. Sure it may not always be the most popular method; sometimes the least complicated things are better! Credit Card: Another straightforward but sometimes pricey dental financing option for your dental care, is to simply pay by credit card. For many patients, this has been the preferred method of dental financing due to its hassle free nature, and the wide variety of cards accepted. At GPS Dental, MasterCard, American Express, Visa, and Discover, are all accepted forms of payment. FSA: A Flexible Spending Account or FSA is a special account you put money into that you use to pay for certain out-of-pocket health care costs. It is designed to assist you in paying for eligible medical, dental and vision care expenses that aren’t covered by your insurance plan using tax-free dollars. A FSA helps provide a certain amount of funding for out-of-pocket medical expenses such as prescription medication, co-payments, deductibles, or even medical devices. This of course, is a benefit that is offered by some employers and many of these programs have certain rules that you must follow regarding approved expenses. It’s a smart, simple way to save money while keeping you and your family healthy and protected. CareCredit: CareCredit is another great alternative to help pay for your dental care, as it allows patients to pay for their treatment in a slower, easier-to-manage payment plan as opposed to paying in a lump sum. A CareCredit medical dental card essentially acts as a type of installment plan that allows the patient to offset the balance due by making convenient monthly payments, rather than requiring full payment at once. A CareCredit payment plan can range from 3, 6 to 12 months, and requires no interest. Extended financing up to 48 months is available as well. This makes it one of the highest recommended options for our patients who want dental financing. Because of the overall efficiency of CareCredit in helping patients, the necessary means and assistance for starting the application process can be provided upon your next visit to our office. You can select Payment Options/Insurance under the patient center tab on our website. Click Here to apply for CareCredit as a GPS Dental patient. While we hope that you will find the information provided here useful, we understand that not all dental financing situations are the same. Sometimes a more personal approach is needed. Therefore we are more than happy to meet with you personally so that we may assess your dental financing questions or concerns, and assist you in deciding which payment method is right for you. Remember, here at GPS Dental we want to help you receive the best care possible, and be able to pay for it in such a way that is painless and easy to manage. While the best things in life may not exactly come free, with the right plan in place they certainly come a whole lot easier! Dr. Gary P. Skrobanek and his experienced, friendly team at GPS Dental offer affordable family dentistry and gentle dental care in the San Antonio, TX area. Our office is conveniently located and offers early morning appointment times Monday through Friday to meet your needs. At GPS Dental, we provide most dental services, from family and general dentistry to dental implants, sleep apnea, TMJ / TMD Treatment, cosmetic dentistry and much more. We accept most dental insurance plans and offer affordable financial solutions for any budget. Call us at (210) 633-3477 to make an appointment. While the month of April is typically associated with long days, warm or rainy climate, and of course beautiful blooming flowers, there is another lesser known but equally important aspect of this month. Since 2003 the Month of April has been deemed as Oral Cancer Awareness Month. As you may know, oral cancer is a particularly serious type of cancer that is concentrated within the oral cavity, where it primarily affects the lips, tongue, cheeks, and throat. Annually oral cancer causes approximately 7,500 deaths in the U.S. alone, often occurring in individuals 40 years of age and over, and is often directly linked to heavy alcohol and tobacco consumption. Despite the obvious seriousness of the disease, the early signs and symptoms of oral cancer are actually quite minor. These symptoms may include; unusual lumps or swelling, oral bleeding, raspy voice, and the appearance unusually slow-healing mouth ulcers. Unfortunately the mild aspects of oral cancer end there, as the symptoms will become significantly more pronounced over time and eventually require numerous treatments and surgeries, and may ultimately result in disfigurement and even death. Oral Cancer Screening: CAN save your life! The procedure for receiving an oral cancer screening is not only simple and painless, but it may also save your life! Although oral cancer is extremely serious, it can easily be treated if detected within its early stages. As mentioned previously however due to the relatively benign nature of oral cancer’s early symptoms, these symptoms often go ignored, thus leading the cancer to go undiscovered until reaching the latter stages. This deception may in fact be the likely culprit for the high number of deaths attributed to oral cancer, thereby stressing just how important having regular dental checkups truly are. Generally most dental practitioners suggest that a patient should plan to receive a standard dental checkup every six months. This regular six month dental visit should be particularly prevalent among users of tobacco and alcohol, as the chronic use of tobacco and alcohol products increases the likelihood of developing oral cancer by almost exactly ten times compared to a non-user. 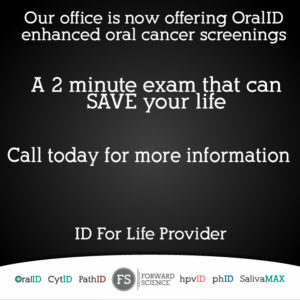 While you may already know this, but oral cancer screenings are a standard part of receiving a regular dental checkup. This means that not only is your dentist checking for cavities on your teeth, but they are also simultaneously giving you an oral cancer screening as well. What you may not know however, is some of the amazing new technology being used in this process today. In giving an oral cancer screening, the dentist gives a visual exam of the patient’s mouth, watching for and making note of any unusual bumps, swelling, discoloration, etc. However thanks to the experts at the Forward Science Company, a new cutting edge technology known as the OralID, is now available to patients and practitioners alike. Using fluorescence based technology; the dentist is able to scan the patient’s mouth with a blue light, thus enabling the practitioner to better identify cancerous or pre-cancerous abscesses, lesions, ulcers, or other abnormalities. This allows your dentist to not only easily recognize any of the telltale signs of oral cancer, but also identify any potential GI tract issues that a patient may be facing as well. While Oral Cancer remains a serious worldwide health concern, remember that there are numerous ways in which your dentist can help you if in fact you are having such concerns. So remember while the month of April may present you with many opportunities to stop and smell the flowers, it may also present you with the opportunity to make that all so important dental appointment and get an oral cancer screening, it could save your life. Dr. Gary P. Skrobanek and his experienced, friendly team at GPS Dental offer affordable family dentistry and gentle dental care in the San Antonio, TX area. Our office is conveniently located and offers early morning appointment times Monday through Friday to meet your needs. At GPS Dental, we provide most dental services, from family and general dentistry to dental implants, sleep apnea, TMJ / TMD Treatment, cosmetic dentistry and much more. We accept most dental insurance plans and offer affordable financial solutions for any budget. Call us at (210) 633-3477 to make an appointment. Don’t delay, schedule today! Let’s face it, everyone hates a chipped tooth! Not only is the act of chipping a tooth an unpleasant and often painful experience, the appearance of a chipped tooth can sometimes be a source of stress and embarrassment, which no one wants! Fortunately, dentists are well aware of this predicament, and are eager to help. There are three primary ways that a chipped tooth can be treated, and the selected treatment method often varies depending on the circumstances surrounding your needs. Bonding or filling, is very common within dentistry and is a practice that dentists nationwide have been using for many years to treat a chipped tooth. This procedure involves the melding of composite resin to the remaining portion of the chipped or damaged tooth, thus repairing the damage. This process also provides an aesthetically pleasing solution that can last a number of years. While bonding has proven itself to be an easy solution for cavities or minor chips in teeth, if the damage is more significant, your dentist may suggest a crown as treatment. As mentioned previously, dental crowns are a more complicated solution that is necessary if a tooth has sustained significant damage, resulting in a large amount of the tooth being broken or destroyed. A crown is a cap often made of porcelain that encases much of the broken tooth, creating a permanent protective covering. Historically crowns have been one of the most popular solutions among dentists and patients alike to treat a chipped tooth. Due to advancements in the field of dentistry, crowns have continued to become an easier and more effective procedure to perform. If your dentist determines you to be a candidate for dental veneers, then an interesting third option to treat a chipped tooth may be available to you as well. Appearing as a thin composite shell, veneers are designed to be fitted over the outside of the tooth, and conceal any imperfections (chips, cracks, or stains) that your teeth may have. 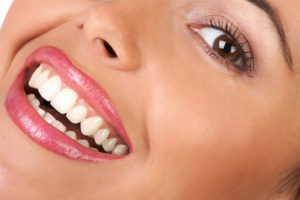 While generally used in cosmetic dentistry, veneers have proven themselves as an effective tool in not only restoring the appearance of your teeth, but in protecting them from receiving continued damage as well. If you have a Chipped Tooth: Make an appointment today! While chipping your tooth is never a desirable experience, don’t prolong the experience when there are numerous treatments designed to help you. If you have a damaged or chipped tooth, you should schedule an appointment right away. Imagine enjoying a wonderful holiday break with your family. As you sit down to have a meal together, you experience an unpleasant surprise. When you bite into your food you feel a cracking sensation, followed by a sharp pain in your mouth. As the stinging in your mouth continues to worsen, the reality of what has just happened sets in; you have just broken a tooth and need emergency dental care! Unfortunately, this make-believe scenario has been a reality for many people; when you break a tooth it’s often a sudden, unplanned problem that delays any plans you may have, because all you can think about is getting out of pain! Who will you call when you need emergency dental care? At GPS Dental we are prepared to assist our patients when a dental emergency occurs. When patients call in this type of scenario, we always do our best to accommodate same day emergency appointments. These are both valid and understandable reasons for requesting an emergency visit, and here at GPS Dental we are willing to help address these unexpected issues when they arise. Sports Injuries can cause a dental emergency. Injuries to the mouth and teeth during physical activity and playing sports are easily prevented with a custom-made mouthguard by the staff at GPS Dental. A mouthguard is an essential piece of athletic gear that should be part of your standard equipment from an early age. Studies show that athletes are 60 times more likely to suffer injury to the teeth if they’re not wearing a mouthguard. Broken teeth and injuries to your lips, face, jaw or tongue can be minimized, because mouthguards help cushion a blow to the face since they are typically covering the upper teeth. The best type of mouthguard is one that has been custom-made and fitted for your mouth by Dr. Skrobanek and his team at GPS Dental. If you wear braces or another fixed dental appliance on your lower jaw, your dentist may suggest a mouth protector for these teeth as well. If you have a removable appliance or retainer, do not wear it during contact sports. You may not be able to anticipate when a dental emergency will happen; however, you can rest assured that you will receive swift expert emergency care when you call our office. So many of our patients ask us how to ease dental anxiety for their kids. We’d like to offer 3 simple tips. For many years, a trip to the dentist has been a stressful for both adults and children. The stereotype of a dental office being a scary place in the past was true for many reasons. However, over the years advancements in dental technology and the high number of prominent dentists with offices that are calm and soothing, instead of sterile and intimidating have shifted this stereotype out of our reality. Now this has become a thing of the past. Although the fear or anxiety of visiting the dentist is relatively small among adults today, for some children this fear still remains and gives them anxiety. It can cause visiting the dentist to be a very stressful ordeal for those children and their parents. We encourage parents of young children to take an active role to help manage and reduce this fear at an early age. To help, we have comprised a list of three useful tips and ideas that may help you in the process when trying to figure out how to ease dental anxiety. We want you and your child to enjoy a stress-free experience when visiting the dentist’s office. 1. 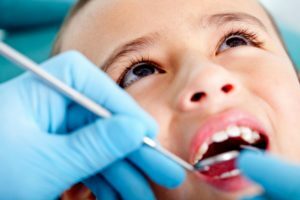 How to Ease Dental Anxiety: Why start kids early? In order to prepare your child for what to expect when visiting the dentist, the most important step is to simply start scheduling dental appointments at an early age. Many experts that offer dentistry for kids agree that parents should schedule the first appointment before the child’s first birthday. To evaluate and prevent issues that may occur at an older age. This may seem unnecessary when the child is still very young and beginning to get baby teeth; however, this gives a dentist the chance to observe and assess the developing teeth. This is an important and proactive step in dentistry for kids and sparing your child from future issues or discomfort that may arise. To introduce the dentist to the child and the dental office. If a child does not receive regular dental care, then a visit to the dentist may seem strange and frightening; as they are not familiar with the situation. By getting your child accustomed to making regular trips to the dentist from an early age, it allows them to become comfortable with the atmosphere of the dental office which will likely make a huge difference in reducing any fear or anxiety. 2. How to Ease Dental Anxiety: Leading by example, how you can set the tone. In the eyes of a young child, there is no greater role model than that of a parent or guardian. If your child is fearful when visiting the dentist, instead of telling them how they should behave, perhaps it would be better to show them instead. This is easy; bring your child with you during one of your dental appointments, so they can watch you. They’ll see you, the most important person in their world, set an example of how to act when you visit the dentist. By showing your child there is nothing to fear during a dental appointment, your child is much more likely to associate the dental office with positive feelings rather than negative. 3. How to Ease Dental Anxiety: Eyes on the prize! Rewards can make the difference. As you already know, providing a little added incentive is always an effective motivational tool to encourage someone to overcome an obstacle. This is particularly true with children; when facing an obstacle or challenge if they have fear, anxiety or lack the motivation to push through. If your child remains genuinely fearful of going to the dentist, consider turning this fear into a challenge for them. Perhaps your child has a particular place they would like to go, (such as an amusement park or the zoo) or maybe they desire a certain toy or item? If a reward is promised for good behavior during his or her dental appointment, then this may provide your child with the motivation they need to face their fears. Keeping their eye on the prize can also add a certain amount of distraction at the excitement and anticipation of receiving their reward. While the historic reputation of a trip to the dentist being a scary experience for kids may still be a common stereotype, with help from parents, this idea can continue to become something of the past, as the future of dentistry for kids continues to grow brighter with every smile. Many people know that eating too much of anything is a bad idea; the old adage “everything in moderation” should definitely apply to your sweet tooth! Cutting down on sugary snacks is one way to keep your pearly white smile. Unfortunately, sometimes it can go sour and tooth decay can happen. Do you know how? 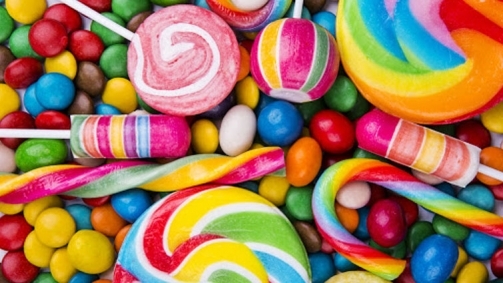 Can My Sweet Tooth Cause Tooth Decay? When you eat sugar, there is a series of events that begin to happen as soon as you pop that sweet treat in your mouth. But sugar alone does not cause tooth decay. If your teeth are not properly cleaned, the tooth enamel can begin to wear down and cavities can form. Your mouth is filled with hundreds of bacteria, many of which benefit the health of your teeth; however, some are harmful. These harmful bacteria feed on the sugars that are left on your teeth when they are not brushed after that sugary snack. They create acid that destroys your tooth enamel. Your tooth enamel is the shiny, outer layer that protects your teeth; if this layer becomes compromised, decay and cavities can form and leave tiny holes in your teeth. If the cavity isn’t treated properly, additional issues, such as gum disease and tooth loss can occur. See how your sweet tooth can go sour, quickly? Brushing and flossing away the plaque (twice each day) will make it harder for a cavity to develop because you are strengthening your enamel at least twice every day. By adding regular visits to your dentist for thorough dental exams, you’re well on your way to preventing cavities and keeping your mouth healthy. As a New Year begins; many people find themselves with one or several goals to accomplish in the New Year. These goals are traditionally known as New Year’s resolutions and are often used as a means for personal reflection and self-improvement. Two of the most common resolutions that people have involve the improvement of one’s overall health and making better decisions financially. However, if you are a smoker, then quitting smoking is one resolution that would significantly improve both of these aspects in your life. Quitting smoking remains one of the primary New Year’s resolutions on the list of many people nationwide. And when it comes to teeth whitening and smoking, we can help you achieve a healthier smile. For many years, some of the serious long term health effects of tobacco smoke on the lungs and throat have been well known to the general public. However another serious, but often overlooked health concern is smoking’s effect on oral health. Due primarily to the excessive amount of tar in cigarettes, many smokers will notice their teeth developing a yellowish hue, as opposed to a healthy white smile. Unfortunately, this yellow staining will become predominantly worse over time. And in the case of heavy smokers, continue to stain the teeth until they begin taking on a sickly brown appearance. 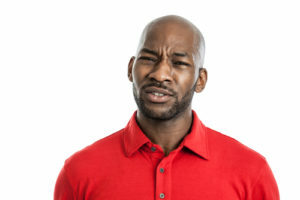 Obviously this can cause a great deal of unwanted attention and embarrassment for the smoker suffering from this condition; often leading the smoker to experience a certain amount of anxiety in social situations. Another concerning and potentially embarrassing problem that occurs as a result of cigarette smoking is gum disease. As you probably know, all people have a certain amount of bacteria in their mouth at any given time. While this is normal, having too much bacteria in one’s mouth (especially if it happens frequently) can cause an imbalance. It’s this frequent imbalance of bacteria that causes the gums to develop infections, which if serious can permanently damage the smoker’s gums; ultimately resulting in the development of gum disease. Although in early stages, gum disease may present as simply foul and unpleasant breath, as the disease progresses it can lead to much more serious scenarios such as tooth decay, tooth loss, oral nerve damage, or permanent jawbone damage. A third and final condition to result from tobacco smoking is that of oral cancer. As you can probably guess, out of all of these health concerns, oral cancer is by far the most severe as approximately 7,500 deaths will occur in the United States annually either due to or related to complications from oral cancer. These staggering numbers typically stem from the rapid progression of the disease, and often the failure of the individual to seek the proper diagnosis and treatment within the early stages of the disease. While a smoker’s fight to preserve their oral health may seem like a daunting task, there are but few greater allies in this battle than that of your dentist. How do teeth whitening and smoking relate to each other? Although you might not realize it, but when you visit your dentist for a teeth whitening or to just simply have a routine cleaning, your dentist will also simultaneously preform an oral screening as well. This is a crucial step in treating or preventing oral cancer and other afflictions caused by smoking as they often go undetected until it’s too late. Teeth whitening and smoking: Another effective but often overlooked service that your dentist can provide you with is the actual process of teeth whitening. In whitening a patient’s teeth, a dental practitioner will apply fluoride as a varnish or gel to the teeth, thus whitening and ultimately eradicating signs of damage caused by either smoking or even just a sweet tooth. While this might sound superficial in nature, some dentists find that once a patient who smokes is able to see what their smile would look like without the damaging effects of smoking, only then do they find the motivation and drive to reduce their tobacco smoke intake, and eventually quit altogether. See, teeth whitening and smoking are definitely related! Although New Year’s resolutions such as exercising more often or getting a promotion at work are certainly admirable goals to have; if you’re a smoker then quitting smoking should certainly be on that list as well. Remember a New Year brings new opportunity to improve your quality of living, and what better way to do that than to improve your health and finances by ridding yourself of this worrisome habit. If you’re a smoker and want to achieve a whiter, brighter, healthier smile this year, talk to Dr. Skrobanek and his expert team about teeth whitening and smoking. Contact GPS Dental at (210) 633-3477. Don’t think about your dentist when it comes to sleep problems? That’s no surprise. But it’s very likely that he or she may be able to help, especially if your problem is related to sleep apnea. At GPS Dental, Dr. Skrobanek is specially trained to custom fit oral appliances, more commonly called mouth guards, that help control snoring and sleep apnea problems. If you suffer from sleep apnea, the soft tissues and muscles in the back of your mouth and throat relax to the point of collapse, thus blocking the airways and reducing oxygen intake. The body then awakens just long enough to resume normal breathing and then drifts back to sleep. Most of the time, the person doesn’t even realize they are having problems, other than how badly they feel during the day. It may feel as if they haven’t slept at all. It’s important to ask yourself if you suffer from any of these symptoms. If so, come talk to Dr. Skrobanek and get fitted for an oral appliance you can wear at night. Oral appliance therapy is a research-backed treatment option that’s available should you find that you suffer from sleep apnea. The appliance fits like a retainer. Many have already been approved by the FDA as an appropriate treatment for this disorder. These custom fitted mouth guards work to keep your airway unobstructed during the night, which allows you to breathe normally and sleep much more deeply than before. If you are experiencing any of the symptoms of sleep apnea, come talk to Dr. Skrobanek about a custom mouth guard. Contact GPS Dental at (210) 633-3477. While most dental issues probably won’t kill you, oral cancer is a condition that could be life-threatening if it isn’t spotted early. If you smoke, drink alcohol, or have a family history of cancer, you are at most risk for developing oral cancer. It usually presents itself as a persistent sore or growth in the mouth. Early detection and timely treatment are key to catching cancer early and treating it effectively. The team at GPS Dental wants you to know what to look for, so we put together this list. Have you experienced any of the following symptoms of oral cancer? Some of the symptoms that can signal oral cancer can look like other conditions, so it’s important to get a skilled professional’s opinion. Recent research has also determined that the HPV virus is a leading new cause of oral cancer in non-drinking non-smoking young adults who are sexually active. At GPS Dental, we include an oral cancer screening with every examination. We use Oral ID™during the oral exam. This “fluorescence technology” allows the doctor to identify any suspicious areas at an earlier stage, thus saving lives. Plus, it’s absolutely painless for our patients. If you notice any of these symptoms, don’t wait, contact us. Come see us at GPS Dental and let Dr. Skrobanek take a look at it. He will tell you if it requires further examination by a specialist. Call us at (210) 633-3477 to make an appointment or ask questions. He’s the perfect guy; thoughtful, loving, and caring. There’s just one problem — he’s a snorer! He snores so loud that you can barely sleep at night, and you don’t know how much longer you can go without sleep. Well, in actuality, both of you are probably not getting much sleep despite his loud testament to sleeping. Snoring can lead to restless sleep, daytime dysfunction and more. Luckily, the team at GPS Dental can help! According to the National Sleep Foundation, snoring is a problem that affects approximately 90 million Americans. Needless to say, many couples are going through the issue of one person being a very loud snorer. Snoring is caused by the muscles in your throat and your tongue relaxing too much while sleeping, which causes the throat to become more narrow. The air going in and out of the throat then causes the characteristic sound of snoring. Snoring becomes more serious with age and is more common in overweight individuals and males. What Are the Side Effects of Snoring? While we may joke about our partner’s snoring, the side effects are no laughing matter. Sometimes, the walls of the throat can collapse completely, which can cause a cessation of air. When that happens, the person’s breathing stops and that’s never a good thing! This is known as sleep apnea and is a serious medical condition. A really great solution for sleep apnea is oral appliance therapy, also known in simpler terms as a mouth guard. The GPS Dental team can custom fit a mouth guard to your jaw in a way that maintains an open upper airway even as the throat muscles relax. This allows you to breathe safely and comfortably throughout the night while also allowing your partner to get a restful night of sleep. Although CPAP (Continuous Positive Airway Pressure) machines prove to be the most effective way to treat advanced sleep apnea, studies have shown that half of all CPAP wearers cannot tolerate using their CPAP mask on a regular basis. Oral appliance therapy can be as or more effective than the CPAP mask for many of these individuals and is far more comfortable and acceptable for nightly use. Also, many medical insurance companies are now covering these appliances when a CPAP is not tolerable. Call and ask GPS Dental how they can help to determine eligibility for oral appliance coverage when a CPAP is just not working out. Since over 100 oral appliances have received FDA clearance, it can be difficult to select the right one. Dr. Skrobanek has had special training and can recommend the device that is best for you. Also, note that oral appliance therapy is covered by many medical insurance plans so this may come at little to no out-of-pocket cost to you. Read more about oral appliance therapy here. To see if you’re a candidate for a mouth guard contact us online or call us at (210) 633-3477.